As disrupter-in-chief, this is the week that Donald Trump has turned the U.S. presidency into a remarkable weapon. With his unique deftness, Trump has managed to all-but-split the American alliance with Europe, pinned his hopes on reaching an unprepared-for agreement with an untrustworthy North Korea, has offended the European allies, already off-put by tariff policy, by calling for Russia to be reinstated to the G-7 group. Just moments after a closing communiqué was read aloud, Trump blasted it from Air Force One, already on route to the Singapore summit with North Korea. With specific tariffs and trade substituting for security, Trump has cut ties with long-time allies in Canada, Mexico and Europe. Trump is doing all this with a White House team that is split, a Congress that is seething at him, and an American public that is about as deeply divided as ever recorded. If there had been a provable, intentional campaign from Russia for the election of a candidate who could ruin traditional American strengths and replace them with a dissenting, argumentative, untethered American isolation, you might credit Vladimir Putin with having achieved his wildest dreams. Despite smiling faces during the G-7 meeting, the gathering apparently persuaded Trump anew the United States is being treated unfairly by countries with which prior presidents had long ago negotiated trade agreements for the flow of goods and services. “The result was a slow-rolling collapse of the fragile alliances that officials at the summit—and even Mr. Trump’s own White House advisers—insisted throughout the day could be maintained in the face of fundamental disagreements,” said the New York Times. 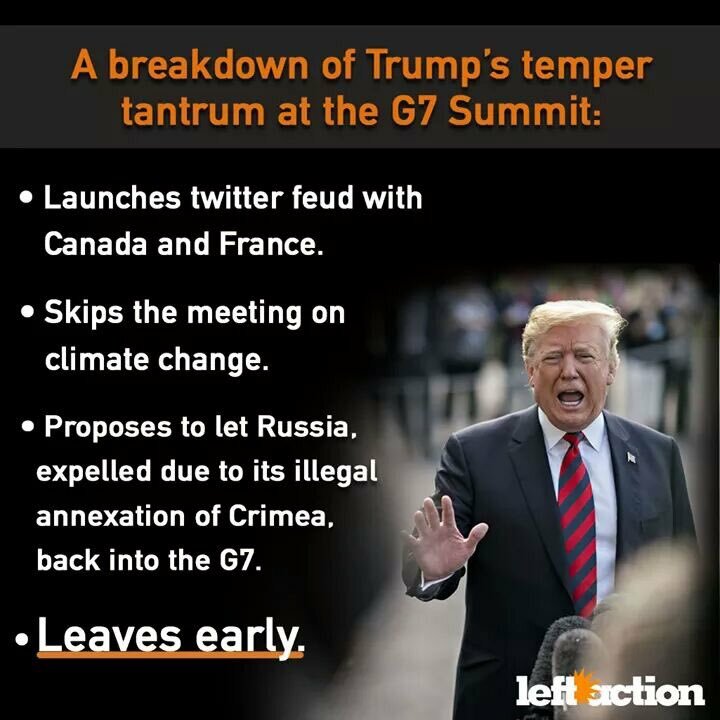 As The Washington Post editorial yesterday noted, “Trump’s decision to sow ferment within the G-7—to antagonize America’s closest allies—is more than a childish tantrum or a play for attention. Whatever else results, the outcome, for now, seems inevitable. America First has become America Alone. The joke at the allies’ meeting in Canada this weekend was that the group has become the G-6 plus 1, the United States. It helps no one anywhere for Europe to feel as if it has been spurned by the United States. Meanwhile, the picture (left) of Chinese Premier Xi Jinping meeting with Putin in China seemed to take on disproportionate importance. Those two countries are clearly on the rising influence scale, while Trump is pointing us in a different direction. Let’s remember that the G-7 meetings began among Britain, Germany, France, Italy, Canada and Japan 40 years ago to look for points of economic and security commonality, preventing precisely the sorts of trade issues that President Trump is now inflaming. After a year of being restrained to some extent by advisers who championed that global order, Trump has replaced much of his national security team with more like-minded aides and is finally acting on his “America First” impulses in ways that are sending shock waves across Europe, Asia and North America. Even the leader of the engagement strategy, President Emmanuel Macron of France, seems to have given up, publicly expressing deep frustration with Mr. Trump and warning that the United States will isolate itself, Baker noted. Trump said that he brought up with America’s closest allies the dramatic prospect of completely eliminating tariffs on goods and services, even as he threatened to end all trade with his counterparts if they do not stop what he says are unfair trade practices. On top of all of his tariffs talk, Trump arrived late, and left early, to set off in search of a totally undefined negotiation with North Korea’s Kim Jong-Un. In calling for Russia to be re-admitted to the group of western democracies, Trump offered no reason. He has ignored the fact that Russia was expelled over invading Ukraine and seizing portions of the Crimean Peninsula. In Washington, lawmakers of both parties were either aghast or chose to ignore Mr. Trump’s suggestion on the assumption that it was yet another offhand remark just to stir the pot, not a serious initiative. Trump’s advocacy for Russian membership in the Group of 7 was in keeping with his against-the-grain attitude toward Moscow. He has repeatedly spoken in flattering terms about Mr. Putin and pushed for closer ties. The campaign for disruption is on at home too, of course, with continuing effort to overturn health care protections, consumer protection, environmental regulation, education support, labor protections, even free speech flare-ups. Maybe the reliance on disruption explains exactly why there is a depth in Trump electoral support: It is tons easier to say the hell with it all than to try to build systems that work. In the end, however, this will not prove helpful to the world or to this country.